This study investigated the effectiveness of in-vehicle information on drivers’ compliance to speed limits in work zones. It was conducted while I was still at UCF with my students (now colleagues) James Whitmire the 2nd and Justin F. Morgan, and my dear friend and mentor P.A. Hancock. Highway work zones are hazardous roadway environments. Significantly more dangerous than comparable pre-work zone roadways in the same areas (Khattak, Khattak & Council, 2002). Crash rates increase by ~ two-fold on highway segments under construction compared to the same highway segments measured previously without the presence of work zones. The majority of people killed in work zones are drivers and vehicle occupants (~85%). Speed has a main contributory role in work zone crashes (Stackhouse & Tan, 1998). This overt behavior is also recognized by the drivers themselves. In-vehicle systems could be used to convey operational information for the driver especially in difficult and demanding conditions (Vashitz, Shinar, & Blum, 2008). Research efforts have provided evidence that in-vehicle information technologies can positively affect driver compliance and improve safety, particularly with regard to driving speed (Brookhuis & de Waard, 1999). Long term effects of a first generation intelligent speed adaptation device found an initial decrease in the time spent over the speed limit. Yet, compliance rate attenuated with time (Warner and Åberg, 2008). 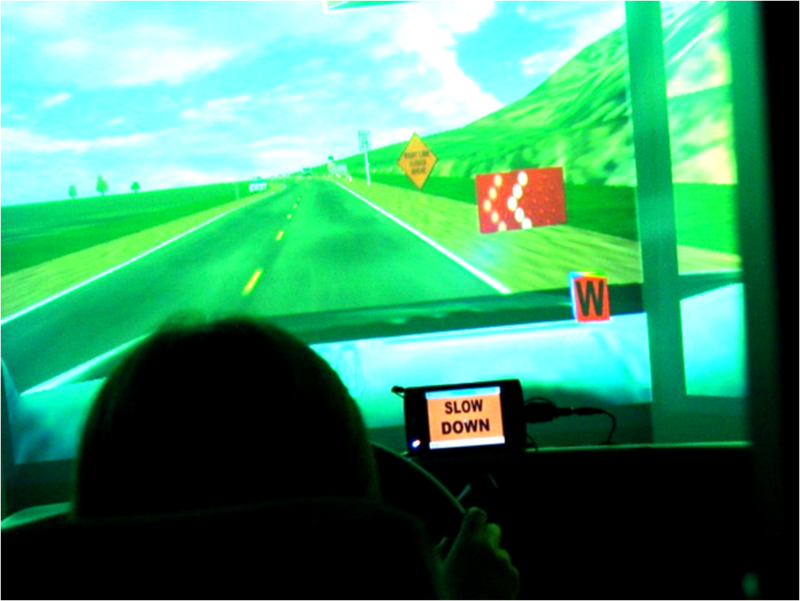 Most contemporary in-vehicle displays do not place excessive visual demand on the driver in normal driving circumstances. Work has been accomplished pertaining to the in-vehicle presentation of audio and/or visual stimuli. Very little has been done to examine the delivery of in-vehicle audio and visual warning systems specifically to enhance safety in work zones. Fig. 2. Images of the visual in-vehicle warning messages. In-vehicle messages corresponded to traffic signs posted in the work zone area. Participants spent an average of 44%, 7% and 18% of the time, for the control, audio and visual condition, respectively in violation of posted speed limit. 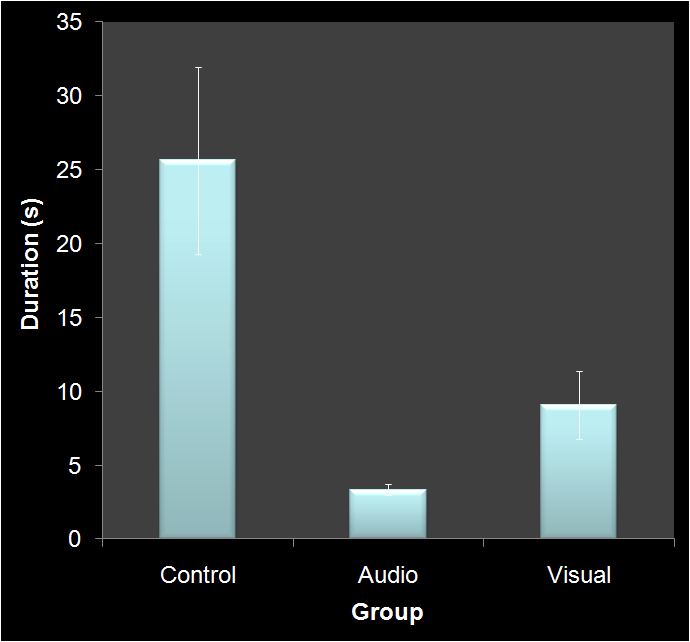 The average violation duration for the control group was significantly greater than that for either the audio or visual groups (Fig. 3). Average violation speed was 55 (9), 50 (5) and 47 (17) Km/h for the control, audio and visual groups, respectively (posted speed limit was 45 Km/h). Drivers with visual\auditory warnings most frequently violated the safe speed upon entering the work zone. However, once they were alerted to this state they typically did not have additional speed violations. Control drivers did not display such a pattern. 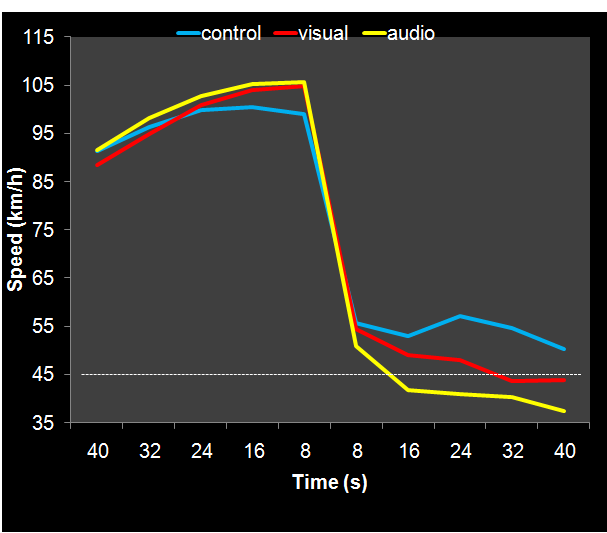 Differences between auditory and visual conditions were present in the time to compliance ; while drivers in the audio condition took 6 seconds to respond, their counterparts in the visual condition took 22 seconds to respond (Fig. 4). The final outcome of both modalities was the same. The longer time to compliance for the visual channel system suggests both the dominance of the auditory channel for this type of information, as well as, the importance of timely alerts through IVISs. As one would predict, based on multiple resource theory (Wickens, 2002), the findings of this study suggest the necessity of redundant signal modalities in driver-messaging systems. Specifically, in order to achieve the best compliance with messages presented to the driver, those messages need to consist of a specific temporal sequence of modalities. The ideal driver message should begin with a brief auditory and visual messages (of a duration no greater than 6.0 seconds), followed by a visual warning message only which remains visible until compliance or acknowledgment. In closing, further research is called for in the specific auditory and visual characteristics of such messages. The density of auditory and visual information, as well as the formatting of text-based messages on in-vehicle displays, remains a largely unknown contributor to the speed and accuracy of a busy driver’s interpretation of the information. Whitmire, J., Morgan, J.F., Oron-Gilad, T. and Hancock, P.A. (in press) The Effect of In-Vehicle Warning Systems on Speed Compliance in Work Zones, Transportation Research part F. Accpeted April 2011.